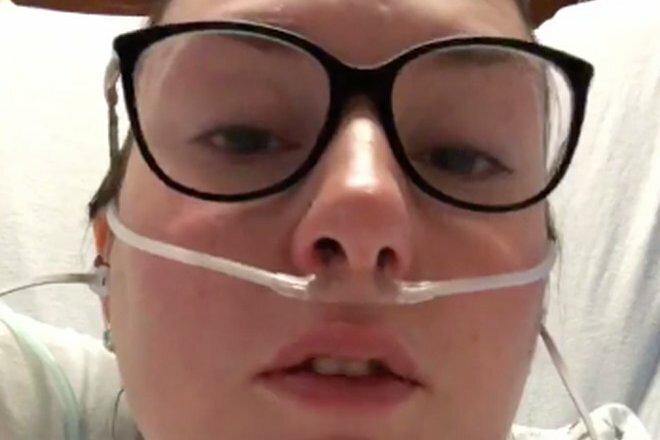 Ashley Spencer tells friends and family during a Facebook Live session from her hospital bed Thursday morning that doctors at the Cleveland Clinic found a mass on her heart. Update, Friday, 1:35 p.m. – Ashley was going into surgery on Friday afternoon. The Philadelphia-area woman who suffered a scary allergic reaction aboard an airliner on Saturday is dealing with another medical scare. Ashley Spencer of Bristol Borough, Bucks County, told friends and family during a Facebook Live session Thursday morning from her hospital bed that doctors at the Cleveland Clinic found a mass bigger than a quarter on her heart. The 28-year-old was to undergo emergency surgery later Thursday. "I'm really scared," she told those watching on Facebook. "I'm asking for prayers." "Honestly, I want to be home right now with everybody," her eyes welling up and her voice cracking, "but I can't." Spencer suffers from Churg-Strauss syndrome, a rate auto-immune disease that causes inflammation of small and medium-sized blood vessels in people with a history of airway allergic hypersensitivity. The syndrome, which can affect the lungs, heart, skin, gastrointestinal system, kidneys, muscles and joints, can be fatal without treatment. It is also incurable. "It overtakes your body and starts to shut down all your organs – slowly but surely," Spencer told PhillyVoice on Sunday. "But I believe in a positive attitude, and that is what keeps me going." Spencer has had round after round of chemotherapy and steroid therapy in recent years in an effort to keep the syndrome at bay. She's had five sinus surgeries and suffers from nerve inflammation. Twice, she has lost – and regained – the ability to walk. On Saturday, Spencer was flying to the Cleveland Clinic for a Monday consultation with specialists to seek treatment options for her anti-immune disorder when she was struck by life-threatening anaphylactic shock, collapsing in the aisle of her American Airlines flight as she struggled to breathe. By coincidence, a young cardiologist from the Cleveland Clinic, Dr. Erich Kiehl, was aboard the flight. He and a nephrologist from the Duke University School of Medicine, Dr. Blake Cameron, sprung into action, administering her Epi-pen and monitoring her vital signs as the plane made an emergency landing in Pittsburgh. Spencer spent Saturday night in the intensive care unit of a hospital there. The anaphylactic shock was brought on by her allergy to peanuts and tree nuts, which was apparently triggered by a bag of kettle chips she purchased at the Philadelphia airport and munched before boarding her flight. Aware of her allergy, Spencer had read the snack bag label to make sure the chips were not cooked in peanut oil. She found no such information. Spencer arrived in Cleveland on Sunday to keep her appointment. On Wednesday, she was scheduled to present a plaque to Kiehl, a small token of her appreciation for saving her life.